The Sennheiser PMX 685i Adidas Sports Headphones are the result of a collaboration between Sennheiser and sport accessories maker Adidas; it is designed to provide good sound quality along with a range of athlete-friendly features. 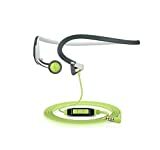 The PMX 685i headphones are designed for use while working out or playing sports and presently retail for $54.27 on Amazon.com. These behind-the-neck headphones are especially useful for runners who may find that over-the-head headphones tend to slip while running. The PMX 685i is Sennheiser’s 2013 model and is similar to the previous 680i version except that it has a thinner band and is somewhat lighter. The 3.5mm jack is at a right angle and there are volume, pause and play buttons to control a smartphone or MP3 player. Sennheiser is known for making quality headphones and the PMX 685i is no exception. Sound quality is just one of the important features of sports headphones and the quality of the sound on the PMX 685i is one of its main features. The 14-millimeter transducers provide excellent sound in a range of music genres without any loss of bass. Even when the volume is turned all the way up, the sound never gets harsh. The in-line remote allows users to have full control of their phone without actually touching it. This can be helpful when running as the wearer can maintain their pace while on the phone instead of having to stop to manipulate a touchscreen. It also allows them to pause, play and skip tracks while running. The remote provides control even with apps like Pandora. These headphones weigh only 19g, which is very light. The neckband is the lightest of all the headphones in this class. The result of the low weight is that the feel of the headphones will not distract users. In addition, because the earpieces are fully supported by the neckband, they fit comfortably in the ears. They are also designed to stay in the ears even during high activity. The included clip allows the user to clip the cable to their clothing so that the cable flapping during their exercise does not distract them. The PM685i headphones do not fit in the ear canals and therefore do not isolate ambient noise. While this may be a drawback for some, it is actually beneficial for users who are exercising outdoors as it can keep them aware of hazards in their surroundings. For example, runners need the ability to hear traffic when running on the street. They are water resistant, which means that they are able to stand up to perspiration as well as to rinsing. They are resistant to shock as well and therefore can withstand harsh treatment in a high-activity environment. The bundled carrying case is sturdy and provides protection for the PMX 685i. It carries both the Adidas and Sennheiser logos. The Sennheiser PMX 685i comes in at a significantly lower price point compared to other headphones of similar quality. You may notice a distinct lack of bass if the headphones are used without the foam earpiece covers. These foam covers are also easy to tear and only one pair is included with the headphones. Note: Sennheiser offers excellent customer service and may even replace these covers for free. Some users may find the four-foot cord to be overly long, even with the clip. Some have found the non-adjustable neckband to be a con. The volume controls only work with Apple products; however, the start and stop functions work with Android products as well. After extended periods of wear, the earpieces may become uncomfortable. While the earpieces are resistant to moisture, some users have found that the volume control can malfunction due to if it gets wet. Users who exercise in a gym or other indoor environment may find the lack of noise isolation to be a con. If there is loud music or other noise around them, it may not be adequately blocked. Sennheiser has a strong reputation among audiophiles as a manufacturer of headphones that produce high-quality sound; however, good sound-quality is just one of the important features. Audio accessories meant for use while exercising must also be comfortable and durable. The PMX 685i has these qualities while still being able to provide the deep bass levels often missing from this style of headphone. Because it functions as a hands-free device, users are able to take calls and communicate without missing a beat. The PMX 685i also does not completely block out surrounding noise so that the user can maintain situational awareness and avoid danger. Overall, the low cost and excellent sound make the Sennheiser PMX 685i essential for active individuals who want to listen to music as they work out.